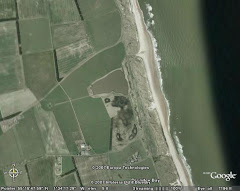 Druridge Diary: Football or birding? On Saturday afternoon I had the choice - go to St James' Park and watch the Toon or go out birding. My patience with the regime at SJP is all but worn out, so at the last minute I abandoned my plans to catch the bus and went birding instead. The birders I met at Druridge were very surprised to see me there I think. It proved to be a profitable visit to the patch - quite the opposite to a visit to SJP! I stopped at the southern end of the patch to scan for hooded crow that had been reported the previous day. There were lots of carrion crows and jackdaws but no hoody to be seen. All of my Druridge 'hoodies' have been seen in mid-April. A couple of wheatears in the dunes were my first for the year though, so not all lost. Next I headed for the Budge screen, where a wood sandpiper had been reported. A male blackcap was singing in the bushes on the way to the screen. As I scanned the mud, I picked out three nice, summer-plumaged 'islandica' race black-tailed godwits and there were at least five ruff, including the striking black and white bird. Six whimbrel dropped in with some curlew. Little Egret from Iain Robson on Vimeo. Whilst I had the camera on the tripod, a wood sandpiper type wader wandered across the mud in front of the little hide, so I had a wander over there. From the little hide the wood sand could be seen much better, but it was still frustrating because of the amount of rush on the pool. A walk through the bushes by the big pool produced two or three singing sedge warblers and singing common whitethroat, which was ringed. There were still 50+ red-throated diver on the sea and at least 20 red-breasted mergansers.